Health Care Fight Spotlights Community Organizers The Virginia Organizing Project is one of many community organizing groups that hoped to have more clout after the election of President Obama, a former organizer. And VOP has now found itself swept up in the biggest organizing effort of the year. 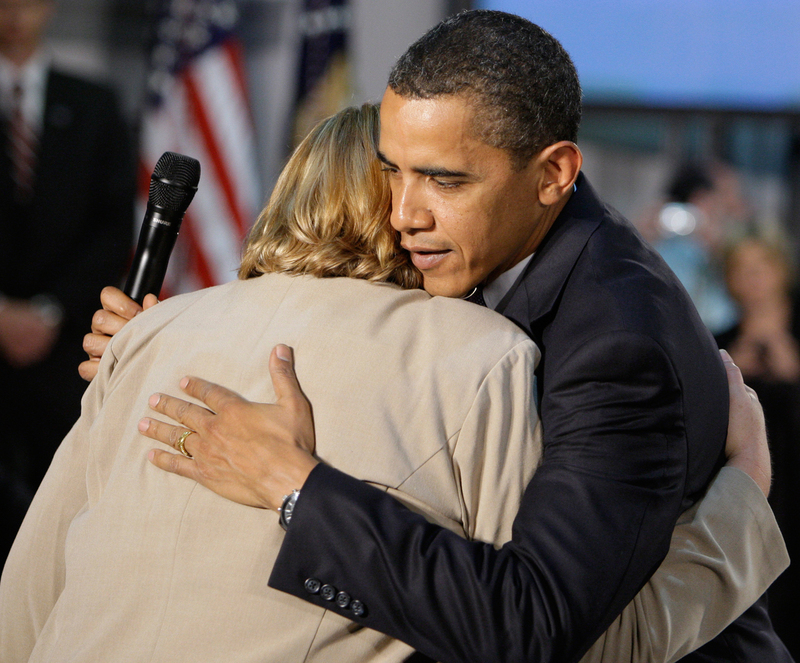 President Obama hugs Virginia Organizing Project volunteer Debby Smith after she asks him about health care during a town hall meeting earlier this month. The Virginia Organizing Project is one of many community organizing groups that hoped to have more clout after the election of President Obama, a former community organizer. The group is finding that it has certainly been more active on national issues this year than it ever has been. VOP usually works on local issues, but it has now found itself swept up in the biggest organizing effort of the year — overhauling health care. And they are having some impact. 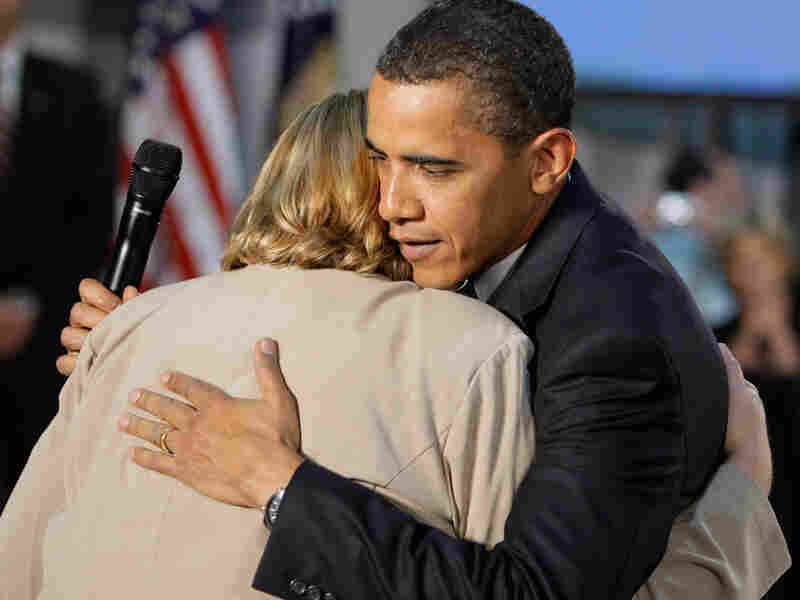 Remember a town hall meeting Obama held earlier this month in Virginia where he hugged a woman with cancer who had no insurance? She was Debby Smith, a VOP volunteer from southwest Virginia. "We got a note from the Office of Public Engagement at the White House saying, 'Would you like to send two people to the town hall meeting?' " says Richard Kirsch, who runs a national grass-roots campaign for health care called Health Care for America Now. "First thing we did was write to VOP and say, 'Do you have people you would like to send?' "
When Obama called Smith's story Exhibit A in the need to overhaul health care, that was no accident. VOP participated in a health care overhaul rally at the U.S. Capitol last month. Organized by Health Care for America Now, it involved thousands of union and liberal grass-roots activists who back the president's health care plan. Joe Szakos, VOP's executive director, says his group's participation is a win-win. He provides ground troops for the national campaign, about 150 for this rally. And Health Care for America Now gives him money to pay two full-time staffers and other costs. "I call it revenue sharing because we're doing it not just to get health care for everybody in the country, but we're also doing it to try to build local community groups," says Szakos. And to strengthen VOP's statewide network. Szakos says after health care, there'll be many other issues Virginians care about. Now, VOP is trying to influence the debate by finding personal stories to illustrate the need for a health care overhaul. VOP interns have been knocking on doors all summer — 140,000 in all — collecting stories like Smith's. Going door-to-door in Alexandria, VOP intern Joe Huennekens asks a woman which issue she cares about most, and like many, she says health care. She says her son died from liver disease, and it was a nightmare dealing with the insurance companies. Huennekens suggests she call Sen. Mark Warner (D-VA) to push for a public health insurance option. "It's toll-free. You call, you press a 1, it connects you and you ask for his office, and then it connects you with him," Huennekens says. He also asks for her phone number and e-mail address. "Cause you have such a strong story about health insurance reform," he says. Huennekens and other VOP interns are collecting similar information from the people they talk to. They enter it into a huge database to be used later to generate phone calls and letters to wavering lawmakers. The following day, Huennekens and five VOP colleagues meet at the Capitol with the staff of Rep. Gerry Connolly (D-VA). Connolly is one of several freshman Democrats who oppose a House plan to pay for health care by raising individual taxes. Huennekens recounts the story he heard the day before. "Her son had had liver disease and had had health insurance through his job, but when he got sick, he lost his job," he says. VOP is trying to exert influence by showing lawmakers that it has its ears to the ground, that it knows what their constituents are thinking. Kevin Simowitz, VOP's intern coordinator, realizes Connolly — like every lawmaker — is getting pummeled from every side. "So if you all have suggestions about ways that we can be helpful to the congressman's position ..." says Simowitz. "It's more important that you dispel the misconceptions. I mean the opposition is spending a lot of money to get their message out," says Connolly's communications director, George Burke. Although it's difficult to know how much impact the group will ultimately have, Burke says VOP's grass-roots work is important. Still, Simowitz says VOP is in it for the long haul. "I just watched five college-aged interns sit in a congressional office and talk with somebody about their summer experience," says Simowitz. He says they now know a lot more than they did about community organizing. The hope is they can put it to use the next time an issue they care about comes along.